The journey has been a theme in great Western literature from the time of Homer’s Odyssey, which the Coen brothers’ movie “Brother, Where Art Thou?” follows somewhat. We all read Robert Frost’s poem of journey, “The Road Not Taken,” in high school. Another memorable travel book you might have read is Yann Martel’s The Life of Pie. And then there was the beatnik classic travel book of the 1950’s, Jack Kerouac’s On the Road. Even though it is a cliché to state that life is a journey, travel stories have their appeal because the cliché is true. Some of us are travelling along roads that are difficult and bumpy. Some of us travel along roads that are smooth and easy to walk. Some of us see vistas, mountains, oceans, whereas others encounter only deserts. Some of us walk along at a brisk pace, almost jogging, whereas some of us, like me with this arthritic knee, hobble along painfully. As we travel along life’s journey, we encounter all sorts of surprises, discovering, at times, the road meandering in ways we never anticipated, creeping along dark trails filled with travails, almost, at times, coming very close to stepping off into an abyss. At other times, we experience sheer delight and unexpected pleasures, like the night I met my wife Sandy on a blind date. As I walked along life’s road these many years, I often could not fathom where I was going, and what sense I was to make of things that seemed to happen haphazardly. Why did that event happen to me? Why didn’t I die when that helicopter came off the deck of the U.S.S. Boxer with me burdened with a heavy pack and lost power, hovering and quivering mere feet from the drink before it regained enough power to get back on the deck? Why did I leave a well-paying job and become a teacher? Was it purely by chance that I met my wife of 48 years on that blind date? Our spiritual life is a journey. I know that now. When I was younger, I couldn’t make sense of the roadmap of my life. But now as I look back on it, I can see how God has been filling in the details of the journey I am on, the twists and turns, the ups and downs; the road is the road he has worked out for me, and I would never be who I am today if he had not done so. My life is not meaningless; the road is not arbitrary and capricious; I am on a journey with a definite destination at the end of which is an inheritance held in trust for me by our Lord and Savior. My spiritual life began over forty-five years ago when I encountered Jesus sitting in the balcony of the chapel of Cedar Springs Presbyterian church listening to a clear presentation of the gospel by Matt Prince, a gifted speaker and evangelist. It was there I encountered Jesus. One of the meanings for the word “encounter” is “an unexpected meeting with someone.” I had a totally unexpected meeting with Jesus. On this third Sunday of Easter, Luke describes an unexpected encounter of the risen Lord with two discouraged disciples who were leaving Jerusalem and on their way to Emmaus. These two disciples were on a journey. But their journey was one of despair. They encounter One along the way who has finished His perilous journey, a journey that ended on a cross for the sake of our salvation. Just that morning, His work on the cross had been authenticated by His resurrection; the resurrection is the certificate and seal of the fact that He is Lord over death. But unlike our Savior who has now triumphantly completed his ordained task on earth, these two disciples of Jesus were dispirited, downcast and disheartened because their hopes in Jesus as the Messiah appeared to them dashed. So this meeting with the resurrected Jesus was indeed an encounter—it was an “unexpected meeting with someone” with someone who was alive while they were certain He was dead. Luke does not tell us why these two men were on their way to Emmaus, although tradition tells us that Cleopas, named in verse 18, lived in Emmaus. All we know is that they were travelling on the very day of the resurrection. These two disciples might well have been a part of the seventy disciples, the outer ring of disciples. This Emmaus road was notorious and is notorious for its dust. The dust could be so thick, the dust could well, and often did, obscure vision. Sometimes, in order to breathe, it was essential to wrap cloths around your mouth and nose. One minister I know who actually walked along this road postulates that Jesus and the two disciples might well have had their mouths and noses covered, which, from his point of view, prevented the disciples from recognizing Jesus. But I believe that their lack of recognizing Jesus was more than a phenomenon of nature, the presence of thick dust, that prevented these two disciples from recognizing Jesus when he joins them: verse 16 states, “their eyes were kept from recognizing him.” The Greek verb that Luke uses which is translated “kept” is a “passive” verb, thus the subjects, the two disciples, in no way brought about this lack of recognition. It happened to them from an outside source. This passive is called a “divine passive” because the Holy Spirit prevented them from recognizing Jesus. And taking the twelve, he said to them, “See, we are going up to Jerusalem, and everything that is written about the Son of Man by the prophets will be accomplished. 32 For he will be delivered over to the Gentiles and will be mocked and shamefully treated and spit upon. 33 And after flogging him, they will kill him, and on the third day he will rise.” 34 But they understood none of these things. This saying was hidden from them, and they did not grasp what was said. Even though they had heard Jesus declare that He must die and rise again, they didn’t understand it, or believe it. These sayings were kept from the disciples (and the two on the road to Emmaus were disciples) because their hearts and minds were not yet ready to receive the good news of Jesus’ resurrection. Theologians use a phrase called “prevenient grace.” A. Cairns, in Dictionary of Theological Terms, states that the word “prevenient” comes from the “Latin pre, ‘before,’ and venire, ‘to come.’” It is the grace that God uses to prepare the soils of our souls to receive the seed of the gospel. God’s prevenient grace was about to come to completion in the hearts and minds of these two disciples. Even though they did not know it, they were ready to receive the good news that Jesus had come out of the grave. God works grace in all of us in preparing us for the gospel. But we must be open to allowing his Spirit to plow through the crust of our oppositions and doubts—sometimes a painful experience as the blade of the plow plunges into the soils of our hearts is needed to accomplish this. Sometimes we need to travel along a dark road before we are ready to see the light. The Holy Spirit knows when it is the right time for the soil of our souls to be completely plowed, softened and receptive, ready to have the seed sown on the prepared field. Parenthetically, Cleopas is a shortened version of the name Cleopatros, which means, “glory of the Father.” According to early church historian Eusebius, Cleopas was Jesus’ uncle, the brother of Joseph. Eusebius also tells us that long after this encounter, after the martyrdom of James when the brother of Jesus was hurled to his death from the high pinnacle of the Jerusalem Temple, Cleiopas became the head of the Jerusalem church. Jesus then begins teaching them all that the Old Testament Scriptures had to say about who and what His mission was going to be in bringing their salvation—all of the passages that predicted his journey to death and resurrection. But that still was not enough to change their towering unbelief. It probably was not as strong a tower as it had been before their encounter with this man they did not recognize in that cracks were appearing in the foundations of their unbelief. Jesus had also knocked a couple of floors off its height, but it was not, as yet, completely demolished. But despite this, they wanted to believe, but just weren’t quite at that point. Later, they said, “Did not our hearts burn within us while he talked to us on the road, while he opened to us the Scriptures?” They were experiencing very strong emotions as Jesus opened the word to them. It is also possible that as he lifted the bread up, the scars on Jesus’ hands were revealed. Whatever the cause, at this moment their “eyes were opened, and they recognized him.” The Greek verb for the opening of their eyes is also passive, as was the verb that described their eyes being “kept” from recognizing Him. Again, this passive means the act was not of their own doing, but something done to them. I believe that is was the Holy Spirit who enabled them to finally see that this was indeed Jesus, their risen Messiah. The great 16th Century baroque artist, Careveggio, captures this scene with typical baroque drama in his painting, “Supper at Emmaus.” Careveggio was a violent, touchy and provocative man who was sentenced to death for murder whereupon he fled from Milan to Naples. His life was tumultuous, but his paintings were and are superb with searing emotions expressed in dark shadows and bright light. 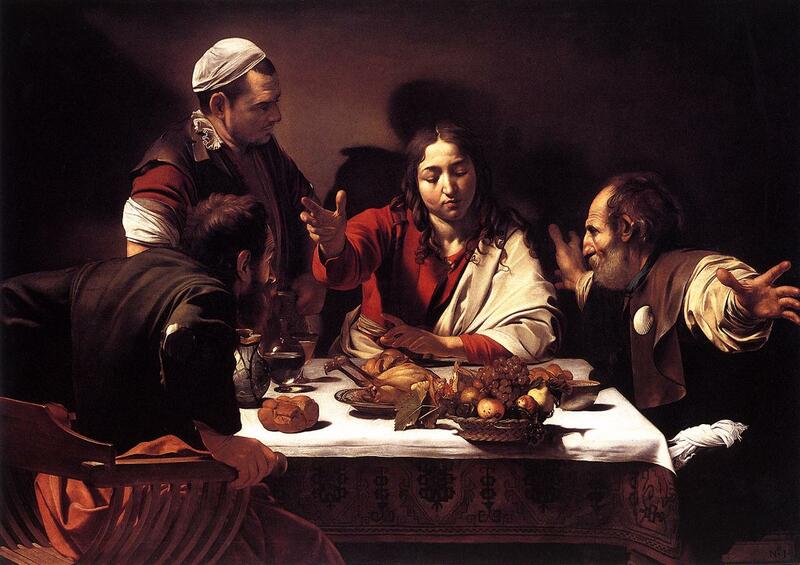 His “Supper at Emmaus” captures the moment the eyes were opened. Jesus faces the front, and on the table are a roasted chicken, grapes, and broken bread. The two Emmaus travellers have their backs turned partially to us, but we can see their expressions. One is leaning forward on the right of Jesus, total surprise on his face, whereas the one on the left has his right arm lifted. But that’s not all that’s so compelling about this painting. There is a fourth man in it. He is standing on Jesus’ right, and he is gazing seriously at Jesus with great concentration. This is Careveggio himself. A sinner looking closely at Jesus as He reveals Himself as Resurrected Lord and Savior. It was after Jesus revealed himself to the Emmaus disciples that the two “said to each other, ‘Did not our hearts burn within us while he talked to us on the road, while he opened to us the Scriptures?’” O, dear Lord and Savior, we pray that our own hearts will warm with fire as the Scriptures are opened up to us! As soon as the two recognized Jesus, He vanished from their sight. It was in the breaking of bread, in the fellowship of the meal, that the encounter with Jesus became joyous. Immediately, they returned to Jerusalem with the good news that they had seen their Resurrected Lord. They cannot wait to say to the other disciples in Jerusalem, “The Lord has risen! He is risen indeed!” I imagine that their pace on the return trip was much faster than lethargic pace leaving Jerusalem. They travelled quickly back to Jerusalem even though they were now travelling in twilight that was quickly becoming night. It was the triumphant end of Jesus’ earthly journey that enabled you and me to begin our spiritual journey toward our own promised resurrection from the dead. As I mentioned earlier, it was Matt Prince who introduced me so many years ago in that balcony in the chapel of Cedar Springs Presbyterian Church. It Matt’s opening of Scripture that the Holy Spirit used to rip the veil away from my face that for so long prevented me from seeing Jesus. And I, like Careveggio, a sinner whose journey had been tumultuous, gazed with astonishment upon Jesus. Let us look back to the time we truly understood who Jesus was, the Son of God, who came to “seek and to save that which was lost(Luke 19:10),” you and me. And let us, this third Sunday of Easter, humbly and sincerely thank him for putting us on the path to complete salvation. And once again, you and I can have a similar Easter encounter on a dusty road with Jesus this morning. We can encounter Jesus in the lectionary lessons read this morning. We can encounter him in the prayers that we pray. And we can encounter Jesus in the Lord’s Supper, which we will soon share. Jesus is spiritually present in these simple elements of bread and wine. By faith, we will be feed spiritually upon the bread of life, and we will spiritually drink his blood as the consecrated wine will be both sweet and tart on the tongue. We will also be reminded in this supper of Jesus’ sacrifice on the cross for our sins. As Paul tells us, “He who knew no sin became sin on our behalf, that we might become the righteousness of God in Him.” And because at some point our eyes, like those of the two Emmaus travellers, have had our eyes opened as Jesus revealed Himself to us, we all will soon experience that Great Wedding banquet at the end of the age when we, along with all believers throughout the ages, will partake of the feast of Jesus as His bride, a feast unlike the one at the end of the Emmaus road that ended all too soon—our feast will celebrate the fact that we will now have eternal life of fellowship with the Triune God and one another.